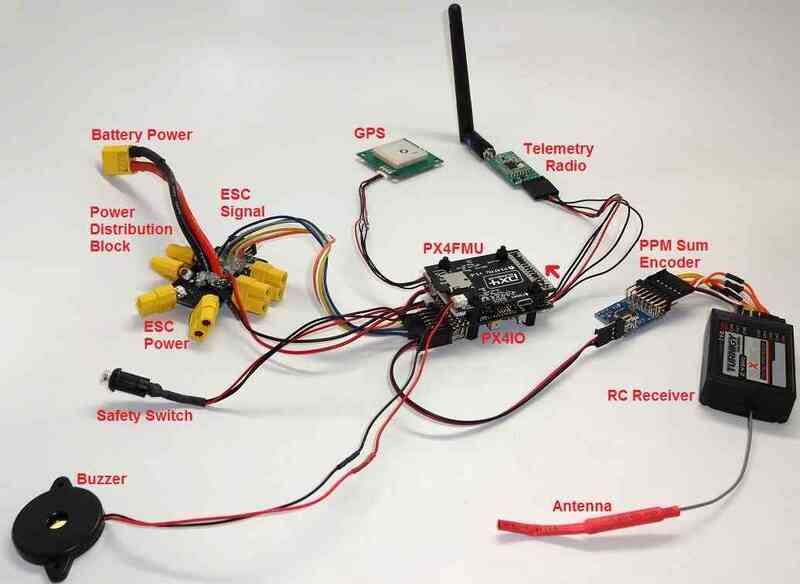 This article provides an overview of the RC Transmitter and Receiver Systems that can be used with Pixhawk along with guidance on how they are connected. For traditional single-wire-per-channel (PWM) receivers, a PPM encoder can be used to convert the receiver outputs to PPM-Sum. To connect a PPM-Sum receiver or an S.Bus receiver, plug the ground (black), power (red) and signal (usually white - orange in the diagram below) wires to the RC pins on the Pixhawk. The following S.Bus receivers have been tested and are known to work: FrSky X8R, FrSky XSR, Futaba R2008SB, Futaba R6008SB. For a Spektrum DSM, DSM2, or DSM-X Satellite receiver, connect to the SPKT/DSM port. 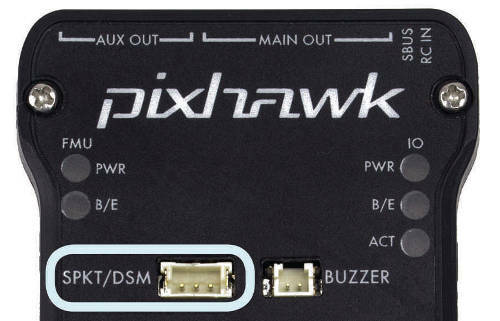 For a MULTIPLEX SRXL receiver, connect the SPKT/DSM port of the Pixhawk to the B/D port of the MULTIPLEX SRXL receiver, without using the +3,3V voltage supplied at the SPKT/DSM port of the Pixhawk and power the MULTIPLEX SRXL receiver separately. This section list radio systems that support PPM-Sum or S.Bus directly. These transmitters are highly recommended for all RC uses. Theses transmitters are a real bargain. You can buy them from different locations e.g. Craft and Theory, Aloft Hobbies . 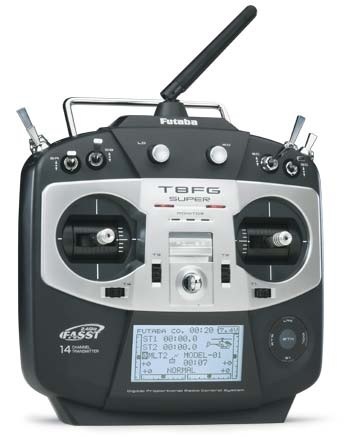 The FrSky Taranis RC Transmitter is a high quality OpenTX (open source firmware) enabled RC Transmitter that is compatible with a wide variety of high quality FrSky PPM-Sum and S.Bus compatible receivers. One of the major advantages of the Taranis is that it can receive and display telemetry data directly from ArduPilot and on-board FrSky telemetry sensors, such as flight mode, GPS status, current drawn and cell voltages, and even ArduPilot messages, that can be added to your vehicle. For more information, see FrSky telemetry. 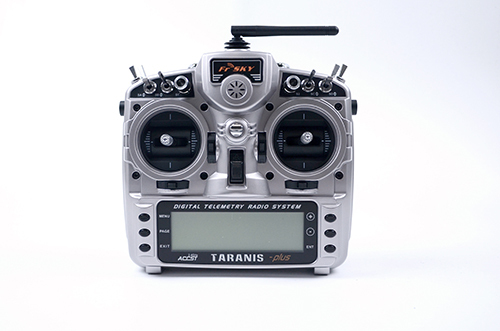 Both the Taranis X9D Plus and the Taranis Q X7 have integrated ACCST 2.4GHz transmitters that are compatible with X series FrSky receivers such as the very popular X8R or the newer and lighter XSR receivers. This means that an additional JR type transmitter module is not required. If needed, both the Taranis X9D Plus and the Taranis Q X7 have JR module bays for external radio transmitters. 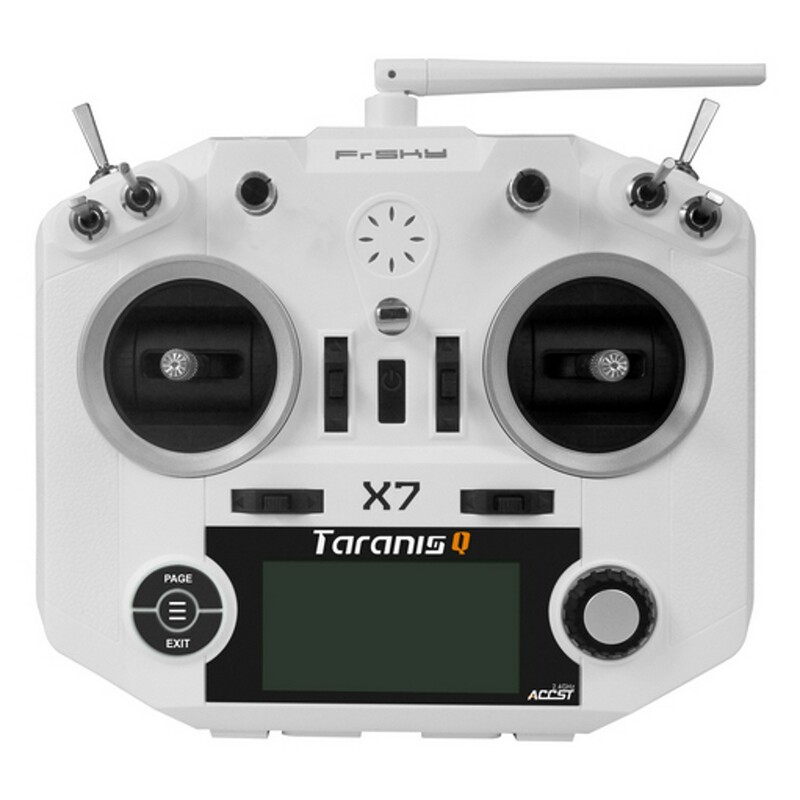 The Taranis X9D and Taranis Q X7 can run the FlightDeck telemetry user interface. 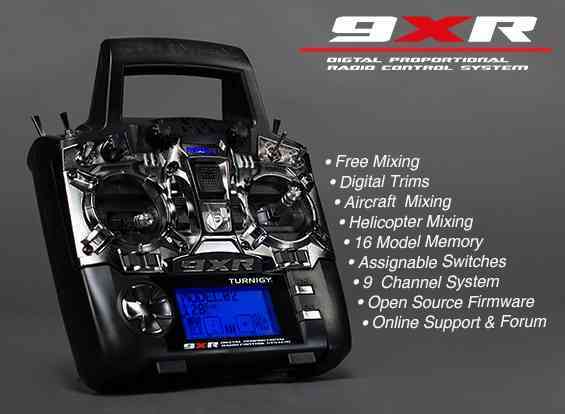 FrSky X receivers are compatible with the FrSky Taranis and XJT transmitter modules. They support S.Bus and bidirectional S.Port telemetry. 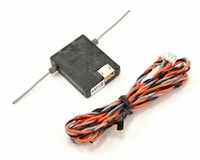 For more information about FrSky X receivers, refer to the receiver section on the FrSky telemetry page. Make sure to connect the S.Bus port on the X8R receiver to the RC IN port of the Pixhawk/Cube. The S.Bus port on the Pixhawk is actually an S.Bus out connection! FrSky X8R receiver and FLVSS LiPo Cell Voltage Sensor (optional) connected to The Cube. Both the S.Bus connection to the RC IN and the S.Port connections are shown. 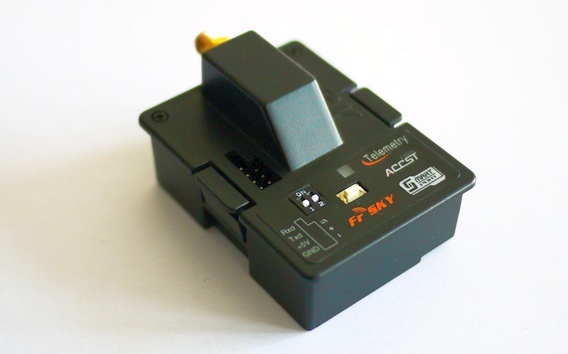 The FrSky receiver and transmitter modules below will work with Turnigy 9x, 9XR (above) and other RC transmitters. FrSKY makes several PPM-Sum and S.Bus receivers and transmitters FrSky’s web site. 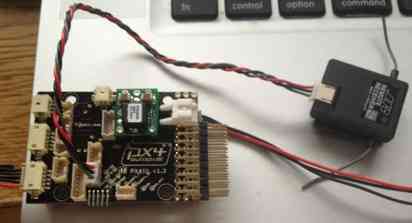 FrSky XSR receiver module with S.Bus and Smart Port telemetry. 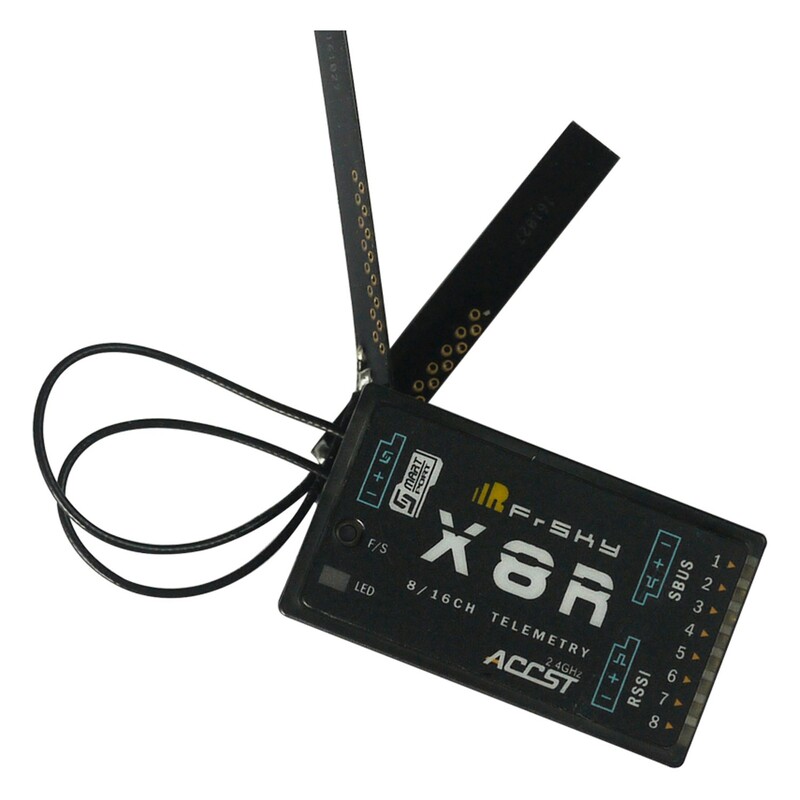 This receiver module has a slightly less range as the X8R but is lighter and more compact. Futaba S.BUS2 receivers are supported since Copter/Plane 3.2. The list above is from pixhawk.org here. In addition to the receivers discussed in the Futaba Transmitter Compatible With Futaba S-Bus Receivers section above, we have anecdotal information that a number of other receivers are also compatible (see discussion Current state of SBus compatibility? on drones-discuss mailing list). FrSky X4, X6 and X8 Receivers on SBUS. X8R receivers (non-EU versions) with OpenTX -Taranis X9D, via the receiver SBUS out on the receiver to RCIN on the PixHawk. OrangeRX R800 receiver that also has SBUS output, with both a Spektrum DX9 and also a Taranis X9D with OrangeRX transmitter module. 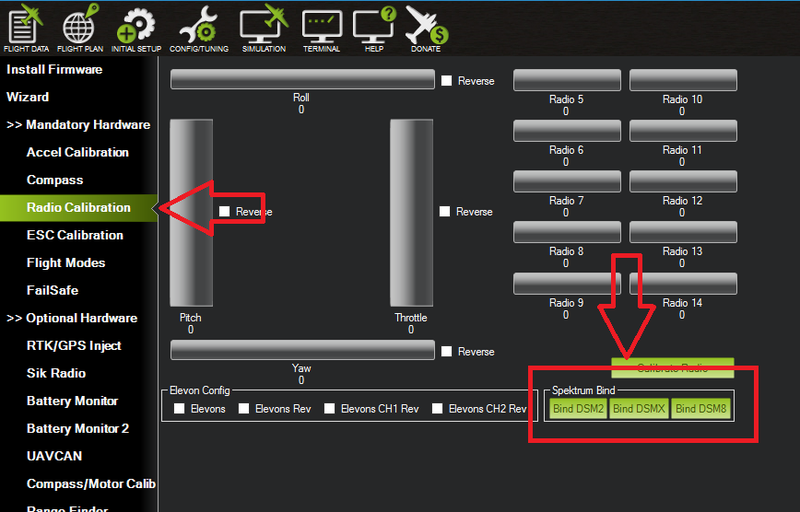 The parameter to enable the SBUS output from the PixHawk is BRD_SBUS_OUT. 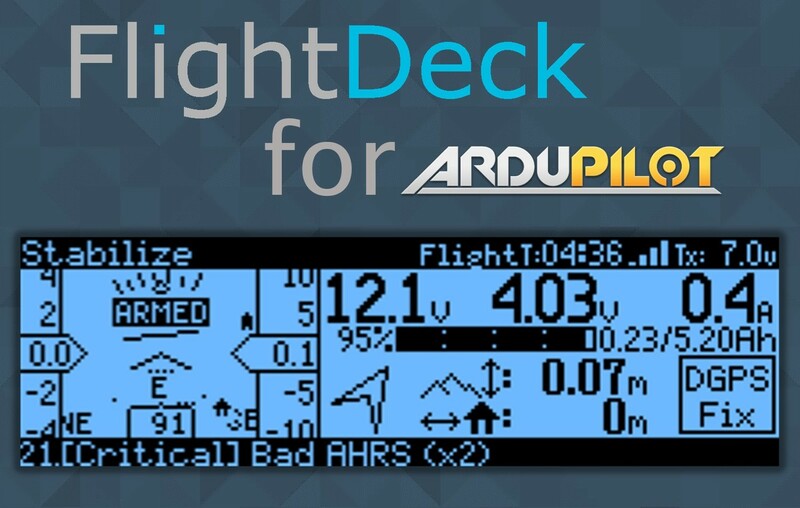 It is feasible to use a single Spektrum Satellite Receiver to act as a DSM receiver with Pixhawk. Simply pre-bind the Spektrum Satellite to your transmitter using a conventional Spektrum receiver with satellite attached. Then connect the tiny Spektrum Satellite receiver to the special “Spektrum” connector on the Pixhawk. The satellite receiver can be bound to transmitter with Mission Planner. This functionality is located in Radio Calibration screen on Initial Setup. Being a satellite, range is limited with this configuration and the preceding receivers and methods may provide greater range. The PPM Encoder does require quite a bit of additional wiring to the receiver. It uses quite a bit of power making it likely you will need to plug in your battery while doing radio setup with USB cable in Mission Planner. The encoder also costs as much or more than several of the available PPM-Sum receivers including the FrSky Delta 8 below. There is addition information about connecting and configuring the encoder here. The diagram below shows how to use the original 3DR PPM-Sum encoder. The linked encoder is used in the same way. You can use a standard radio receiver with an 8 channel PPM Encoder in place of the PPM-SUM receiver. An 8 Channel PPM Encoder is available from jDrones here. Solder a 3x8 Right angle connector from the top into one end of the 8 Channel PPM Encoder board. With the 3x8 connector up and facing away from you, solder a 3x1 Right angle connector on the right edge of the 8 Channel PPM Encoder board. Connect 5-8 output channels of your receiver to the inputs of the 8 Channel Encoder (signal wire furthest from board) with 5-8 female to female servo jumpers. 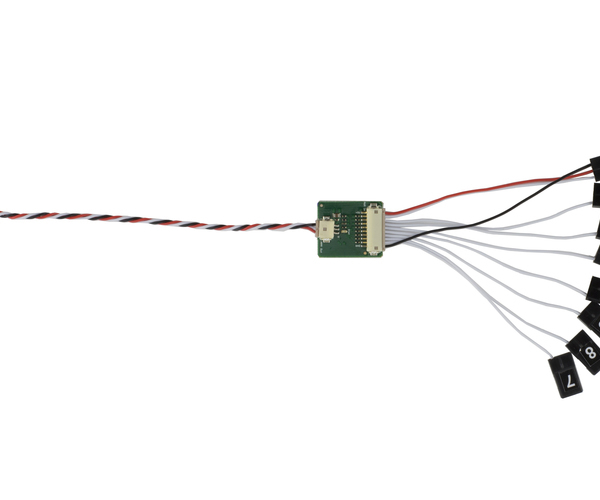 Connect the PPM-SUM output of the Encoder with a 3 wire cable to the PX4IO boards PPM sum input (1x3 connector). If you are using this PPM Encoder it is important to know that when you are calibrating your transmitter you will quite likely need to hook up your flight battery to the PX4IO because the USB port alone can’t supply enough power.